ChoqoK is a microblogging application from KDE, with support for Twitter and Identi.ca. 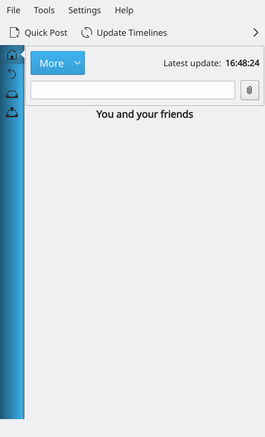 ChoqoK is a small but powerful microblogging application from KDE. It provides integration with Twitter and Identi.ca, support for twitpic URLs and URL shorteners and shows unread updates as well as providing the ability to send notifications to a single or all microblogging accounts. This page was last modified on 6 November 2014, at 15:07. Content is available under Creative Commons License SA 4.0 unless otherwise noted.